The Pappy Hoel Speed Classic presented by Russ Brown returns to the same historic dirt track where it all began back in 1938. 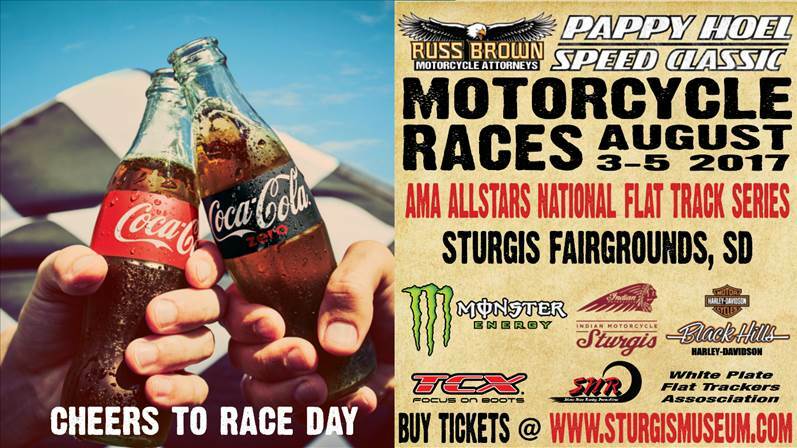 And just like the first flat track race organized by the local motorcycle dealer and area business, the Speed Classic roars back into downtown Sturgis backed by Coca-Cola and area convenience and grocery stores. Stop by Rapid City and Black Hills area stores for a chance to win a Family Fun 4-Pack of 4 VIP passes for the Speed Classic and other prizes. Set for August 3-5, 2017 at the Meade County Fairgrounds in Sturgis, The Russ Brown Pappy Hoel Speed Classic kicks off a full week of racing during this year's Rally. Following the Speed Classic, The Spirit Of Sturgis Antique Motorcycle Races (open to pre-1970s vintage bikes) take place on Monday August 7 (gates open at 4 pm). Fans are invited to an after party and vintage bike show immediately following the antique races on Monday evening at 7 p.m. at the historical Sturgis Half Mile track. Tuesday, August 8 the Sturgis Vintage Gypsy Run heads over to Black Hills Speedway for the American Flat Track Pro Half Mile and then Wednesday is the Sturgis Motorcycle Museum's Hall of Fame Induction Ceremony. "We will be running wide open with the Speed Classic and the Hall Of Fame ceremonies, but that is what Sturgis is supposed to be about," says Tigra Tsujikawa, Marketing & Development Director for the Sturgis Museum & Hall Of Fame. "Sturgis Rally founder J.C. 'Pappy' Hoel started with a race and a week-long party that just sort of evolved from that. We would like to thank Coca-Cola and all the stores in the region for running the promotions for the Speed Classic." In addition to in-store displays and signage on area gas pumps, the backs of all the Coca-Cola delivery trucks are running Speed Classic livery. Also evolving is the Sturgis Block Party fueled by Monster. For the first time this year, the merchants on Main Street have teamed up with the Sturgis Motorcycle Museum and Monster Energy to host a week-long party right in the heart of downtown. "Monster Girls, motorcycles, music and more, all fueled by Monster... it should be a heck of a party," says Tsujikawa. The bands go live at 5 p.m. starting August 4th and running every day through August 12th. Musical acts include Penrose, American Hitmen, Ginger And The Gents, October Rage (all the way from Australia), Chasin' Mason and JagerTown. Best of all, there is no charge to see any of these acts on the Hot Bike Stage at the Museum. "In the spirit of Pappy Hoel the Speed Classic is the perfect way to start the 77th Sturgis Rally, but it is only part of the program," she notes. "Come for the races and stay for the party!" Displays, demo rides, swap meet and more are being hosted by the Sturgis Motorcycle Museum throughout the week, culminating with Hall Of Fame Induction Ceremony presented by Strider Sports. About The Pappy Hoel Speed Classic: For Sturgis Rally founder J.C. "Pappy" Hoel, the focus for the Rally was always on racing. 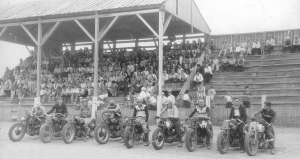 From 200 spectators and 8 racers in the summer of 1938, the Rally brought in more than 800 riders the following year and the race became highlight of barnstorming competitors in the uniquely American sport of Flat Track. The Sturgis Motorcycle Museum & Hall Of Fame is honored to partner with the White Plate Motorcycle Club and Steve Nace Racing Promotions to produce the The Pappy Hoel Speed Classic.